Congratulations ! The original artwork is available for purchase for $159.50 shipping included. You will be able to review this purchase in the subsequent screens. If you have a question, please email support@pastelspace.com. Purchase 2736 x 3648 pixel digital file by using the Buy Now buttons below. You will receive an email with the download link. You can use the link 5 times to download the digital file. In Hinduism, Lord Krishna is depicted as the god of love and being the charmer that he was, he won the heart of any women of any age group that came in his contact. The tales of Radha Krishna are so very common and appealing that they surpass all other tales. Its said that Radha and Krishna never got married, but the bond they shared was so strong that they were considered one soul born in two bodies..
New artwork uploaded. In Hinduism, Lord Krishna is depicted as the god of love and being the charmer that he was, he won the heart of any women of any age group that came in his contact. 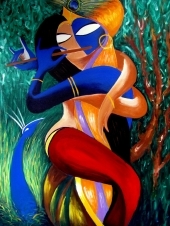 The tales of Radha Krishna are so very common and appealing that they surpass all other tales. Its said that Radha and Krishna never got married, but the bond they shared was so strong that they were considered one soul born in two bodies. Myself Shaikh Parvez Abdullah, belonging to Kolkata, India. Living a simple lifestyle with a huge unfulfilled mental aspirations. Being an active part of Mother Nature, can't able to stop myself to feel it. It has made my senses eager to execute a futile attempt to reproduce my feelings by imitating the Beauty, Wrath, Sorrow, Mirth and thousands of utmost emotions through Photography and Painting.